Make a small cut, several inches up from the "branch collar" on the underside of the branch approximately ¼ of the way through. "This prevents bark from tearing off along the underside of the branch during removal of the heavier outer portion." Then make a cut all of the way through the branch from the top down, removing the majority of the branch. Cut the remaining branch stub away from the main stem, just outside of the branch collar. Do not cut into the branch collar tissue (pictured below). We used dogwood blossoms in just about every wedding this spring. The delicate, 4 pronged flowers add beautiful lines to any floral arrangement large or small. We used long, arching pink branches for statement pieces in one of our April weddings and complimented the large arrangements by featuring the flowers in satellite arrangements as well. We are already missing these gorgeous, fragrant blooms as blossoming branch season gives way to a summer full of flowers! Flower Meaning: Depends on the color; red symbolizes true love, purple represents loyalty, white tulips say "I'm Sorry"
Last fall, we planted a few rare varieties of tulips with great anticipation for what we would harvest in the spring. With an early warm streak, we began to see green sprouts much earlier than anticipated, and we worried that we wouldn't get to use our precious tulips in our spring bouquets like we had planned. Luckily, Mother Nature found her balance and we harvested breathtaking Salmon Parrot Tulips (pictured below) in time to feature them in a few event arrangements last month. We also grew Professor Rontgen and Charming Beauty Tulips and completely fell in love. We were so impressed with the ease of growing these beauties that we are already stocking up on tulip bulbs for next year! Have you ever heard of "Tulip Mania"? It was an economic crash that occurred in the 1600s, caused by a sudden surge in demand for...tulip bulbs. In 1593, Turkey introduced the Dutch to tulips. The Dutch went wild for tulips, and the bulbs were widely sought after for a premium price. A viral genetic alteration emerged, causing vibrant streaks of colors on tulip petals, which increased their value tenfold. Gardeners began seeking certain viral strains for their gardens, and the rarity of these strains coupled with bulb buyers scooping up as many bulbs as possible to capitalize on the bubble, initiated a twenty-fold increase in value! People were trading land, even their homes, for tulip bulbs. By 1636, tradesmen, were indulging in frantic trading of the bulbs - think wall street of tulip bulbs - with some bulbs changing hands up to 10 times during in a single day. Needless to say, this resulted in one of the largest market collapses in modern history. By 1637, speculators could no longer afford to buy the bulbs, demand plummeted along with the price of tulip bulbs, leaving many to suffer from the resulting economic depression upon realizing that they had traded their homes for garden fodder. We love using tulips in our arrangements. Their symmetrical petals, bold colors and gorgeous shape uniquely enhance bouquets and arrangements. What are your favorite tulip varieties? Flower Meaning: "Heady Love, Peace, Sensuality, and Fertility"
One of the most cultivated fruit trees in the world, apple trees originated in Central Asia and were brought to America by early European settlers. Apple trees are now a staple of the American landscape and their fruit is a staple of the American diet. These trees thrive here in Maryland, and while the fall harvest is often a ubiquitous time for these trees, we are particularly found of their spring blossoms. They typically bloom in shades of pale pink to white. In order to successfully pollinate apple trees, you must plant at least two trees of different varieties in close proximity that flower at the same time. 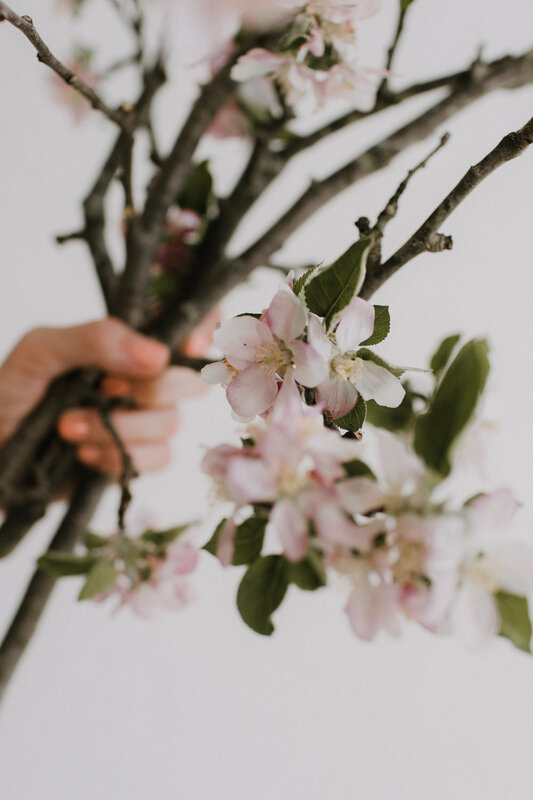 Apple blossoms (and trees) were honored by the ancient Celts as a symbol of love, and they would adorn their bedrooms with these blossoms to entice a romantic evening. The apple blossom is also symbolic of long life, and "it stands for the concept of life continuing, even after we endure a 'death' during the winter of our lives." We love using these blossoms in spring arrangements. Their 5-petal blooms grow in gorgeous clusters on the the large, arching branches and their subtle pink tone is a lovely accent in any setting. Do you have an apple tree in your yard? Have you ever used apple blossom cuttings in an arrangement? Meaning of Flower: "Regard" or "Chivalry"
It's hard to think of spring without picturing the sweetness of the bright yellow daffodil. 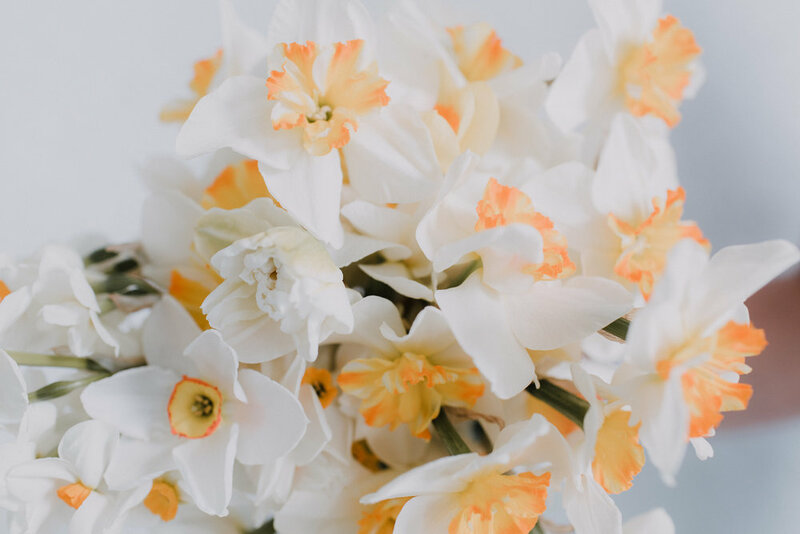 The daffodil is a true spring mascot, beckoning in the year's first days of genuine warmth and fading as quickly as spring often does. Daffodils are so abundant because they require almost no maintenance to grow. Simply plant the bulbs in late fall and revel in your gardening accomplishment as you watch the first green leaves poke through the soil in late March. In Wales, it is said that if you spot the first daffodil of the season, your year will be filled with good fortune. Daffodils are an excellent cut flower. They are lovely paired in an arrangement with forsythia branches. If cut, they should not be placed in a vase with other flower varieties, as they secrete a liquid that promotes wilting in other flower varieties. If you really want to mix them with other flowers, you can put the put stems in a cup of cool water overnight to drain the harmful substance from the stem. You will want to recondition them every few days by trimming the stems and replacing the water to keep them looking fresh. Magnolia blooms are the queen of spring. A symbol of femininity and tenderness, they are thought to be one of the first ever flowering plants on earth. There are over 250 varieties of magnolia, and their flowers range from pink to purple, red and yellow. The commonly known Magnolia grandiflora is an evergreen variety, often growing to 40-100 ft. tall and 30-50 ft. wide and is prevalent locally and in the Southern and coastal United States. These stately trees are an excellent focal point for landscaping large spaces, and provide ample shade during the hot summer months. Their shallow, wide-reaching roots and dense shade prevent other flowers from prospering in close proximity, however, a bench beneath a magnolia grandiflora creates a lovely alcove for a leisurely afternoon. Magnolia Liliiflora or Tulip Magnolia (pictured below) is the most commonly grown deciduous variety. The blooms on these trees are total show-stoppers and they are fantastic for landscaping small to medium areas because they have a smaller footprint than their magnolia grandoflora. Tulip magnolias are a stand-out bloomer, making a striking spring statement. Each year, we cross our fingers hoping they don't bloom before the last frost. Ideal for large, hanging installations or dramatic centerpieces, the fuzzy buds and stunning blooms are one of our favorite parts of spring. We particularly love the unique gray tint of the branches. Standing underneath a tulip magnolia tree in full bloom on a spring day is nothing short of magic.